The Montecristo OPEN Master is a mellow yet very rich Habano, of Robusto format, of 50 ring gauge, 4.9” (124mm) long and comes in a box of 20 cigars. Like other cigars from the OPEN series, this stogie is targeting aficionados that wish to smoke while doing an outdoor activity, and any inexperienced smokers. It is a cigar of a lighter blend compared to the usual vitolas from Montecristo, but it is of Montecristo standard nevertheless. It is a robusto size cigar that is ideal as a morning smoke or as a complementary companion for delicate wines and spirits. Its smooth character generates plenty of rich flavors of wood and tobacco and just the right amount of spice and bitterness. One can also detect here and there some hints of cocoa, of coffee, citrus and of nuts. The Montecristo Open Master is a smooth yet rich cigar. •	Top choice for a beginner thanks to its medium body. •	Plenty of aromas of wood, tobacco, earth and other subtle notes. The perfect companion on the golf course. The Montecristo Open Master has a very nice construction, they are perfectly hand rolled. There are some very delicate little bumps along the wrapper, a few veins here and there, and some medium tooth. Overall, the puro is gorgeous; the wrapper has a nice oily surface of a Colorado claro color. In addition to the traditional Montecristo band, the Open Master is carrying a second ring with the Golden letter OPEN and the word Master. The cigar cuts effortlessly and the foot smells of cedar, hay and leather. The cold draw exhales a strong and classic tobacco smell, as well as some incredible flavors of sweet light caramel mingled with some barnyard. There are also hints of leather and spice. The cold draw is somehow a bit tight, but once lit, it opens up and remains very good throughout the whole cigar. The burn line is a bit wavy at first but soon corrects itself and each draw releases a nice oily smoke that smells of woody and nutty aromas. The ashes hold very well. The Open Master greets you with a light to medium flavor, not as spicy as was the cold draw. The main aromas present right from the start are of rich woody flavors and of toasted tobacco. As the cigar goes on other more discreet flavors emerge, such as cocoa, a bit of coffee and some nice herbaceous notes. Right from the start, the cigar creates a velvety soft smoke, smelling of delicate cedar. A fine peppery spice slowly emerged throughout the initial third, along with some citrus notes. The second third is very similar to the first one, mild aromas of cedar and of tobacco dominate the flavor profile. There are still hints of cocoa, coffee, but now the spicy tone is stronger, giving a much appreciated bitterness to the whole cigar. In addition, a nice sweet buttery flavor makes an appearance and is snow lingering on the palate. The Open Master now reveals its complexity and there is an alternating in flavors between the semi-sweet butter-nut, the spices, the cedar and the citrus notes. It settles finally onto a peaceful deep earthy tone, while the body of the cigar cranked up a notch, and is now a medium bodied cigar. In the last third, the cigar reaches its peak in terms of richness and strength; it delivers deep woody flavors of cedar, and also some strong salty leather notes, on the tongue and bouquet. As secondary notes, there were still some herbaceous hints now mixed with zesty citrus and punchy white pepper notes. One can also detect a distant buttery taste as well as some coffee. All in all, the finish was spectacular and well balanced, revealing the true Cuban character of the Open Master. In summary, the Open Master is a complex Cuban cigar, with intense woody and nice tobacco flavors. While being slightly different than other regular Montecristo, its medium body makes it a very good choice for a new comer to Cuban cigars or as a smoke to take on the golf course. This stick is a great burn,out of the box of 20. I didn’t have a single failure or bad burn. I’ve got a few left and will definitely will re order these. Great flavor for any way you like to enjoy them. You won’t be disappointed. Not a bad stick from Montecristo, but for a Monte, I expected more. I am going to allow them to age another month or two in the humidor before I have another. 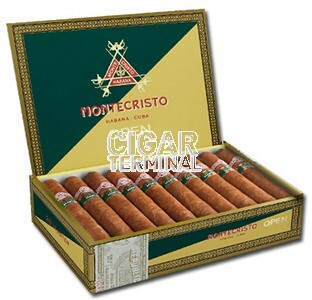 I hope it allows them to "mature" and be up to what I expect from a Montecristo. This is a great quality cigar. Well rolled and a smooth burn. Good flavor but not much change throughout the cigar. I definitely recommend it. I am a fan of silky smooth Cigars with little aftertaste. This was medium strength but smooth all the way through. Would highly recommend to anyone looking for an enjoyable morning or afternoon smoke.